XUZHOU, China, Aug. 12, 2016 /PRNewswire/ -- Global leading construction and mining equipment manufacturer XCMG released the new generation S9 platform concrete machine products at a release conference on July 29 in Xuzhou, a much-anticipated series featuring the world's longest three-axle 52-meter truck-mounted concrete boom pump HB52Kas well as a four-axle 58-meter truck-mounted concrete boom pump with arc-shaped legs. The complete S9 platform products lineup includes truck-mounted concrete boom pump, truck-mounted concrete line pump, trailer-mounted concrete pump, SLM4 self-loading concrete truck mixer, placing boom, aggregate-making facility and wet concrete spraying equipment, offering comprehensive construction solutions to projects with all needs. 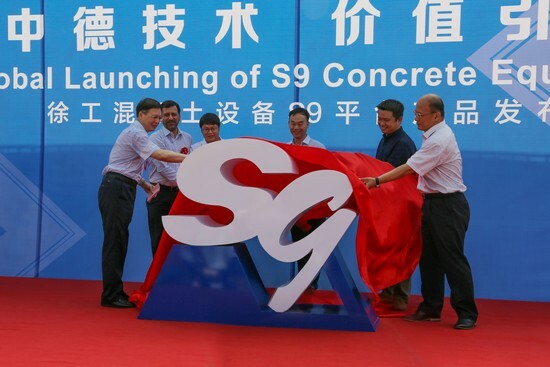 The high efficient S9 platform products adopts the most advanced energy saving technologies, improving the lightweight level of truck-mounted concrete boom pump by five percent and energy saving effectiveness by four percent. The concrete sucking efficiency is five percent higher compared with industry average value. The series was developed with Schwing, Germany's global leading concrete machinery manufacturer which XCMG acquired in 2012. Since then, Xuzhou XCMG Schwing Machinery Co., Ltd. (XCMG Schwing) is committed to creating a new generation of concrete equipment adhering to the highest international standards in the industry. Schwing's exclusive arc-shaped leg and three-level X-leg technologies make the leg extend flexibly and promote the efficiency; while the application of intelligent technologies reduce manual operation workload significantly and ensure comfortable driving. The S9 platform products have passed the Europe Union's CE Certification and Russia's Gost-R Certification, the manufacture process also passed the IOS3834-2 and EN1090-2/3 accreditations among others. "XCMG has integrated the industry's best technologies to research and develop the S9 platform products through strong alliance with Schwing, opening a new chapter in the global concrete machinery industry," said Sun Jianzhong, Vice president of XCMG and Chairman of XCMG Imp. & Exp. Company. "XCMG Schwing has expanded the scope of commercial concrete equipment through resource utilization and technological integration, we aim to create maximum value for clients with a global perspective, and perfect the after-sales service network to resolve all issues promptly," Sun remarked. XCMG is a multinational heavy machinery manufacturing company with a history of 73 years. It currently ranks ninth in the world's construction machinery industry. The company exports to more than 176 countries and regions around the world. For more information, please visit: www.xcmg.com, or follow XCMG Group on Facebook, Twitter, YouTube, LinkedIn and Instagram.